I just found some great information on optimizing your squeeze page in your ezine articles. Squeeze pages are landing pages that are set up to get your visitors to give you their information so that you can build your list of prospective customers. They ask visitors to subscribe to whatever product or service you’re offering such as newsletters, videos, consulting, among other things. They are more than an opt-in box on your site, since there is usually only one choice. The article shows you how you can build a list of highly qualified leads using your articles to do so. 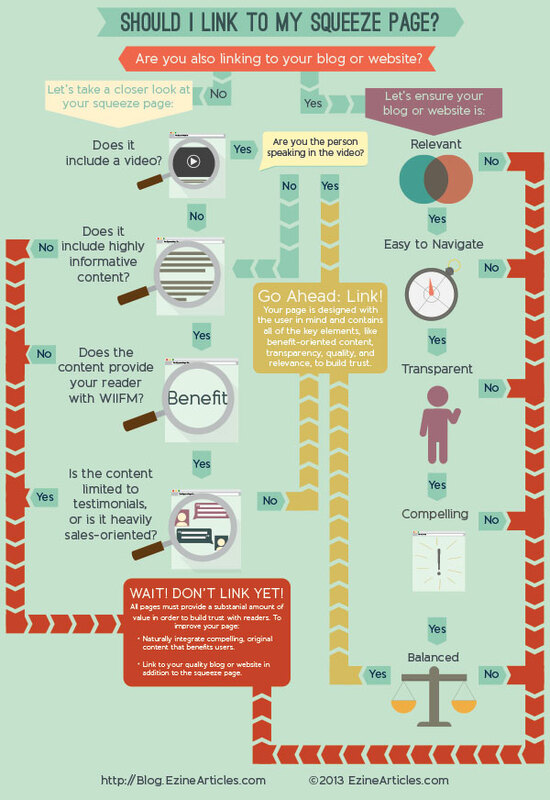 It details things to consider before linking to your squeeze page in the ezine articles. If you’re including a link to your website, is it relevant, easy to navigate, transparent, is the material compelling, and is there balance. If so go ahead and link to your blog or website and your squeeze page in the Resource Box of your article submission. If you’re not planning to include a link to your blog or website, you need to consider other things and then link to your squeeze page in the Resource Box of your article submission. Here’s a great flow chart to help. Check out these great tips for Optimizing Your Squeeze Page in Your Ezine Articles. wow you have got a awsome site very informative and lots of good points on the things you write about Great work!! Love Your Blog..Lots of informative Articles here. Seems like you have a real handle on Optimization. Thank you Eileen for your lovely comments. I try. Great post. Love the mind map – very appropriate and very easy to follow. Outlines some very important steps. Thank you Debbie. I appreciate your comment.